The Michigan state Women’s Bowling association selected Val Mikel for our Hall of Fame. Although most of us did not have the opportunity to know Val, as she passed away at an early age, and had already left Michigan. We can only assume this is why she was never inducted in the Hall of Fame for Michigan. She was born in Texas and moved to Detroit as a young woman, where she had much bowling success. 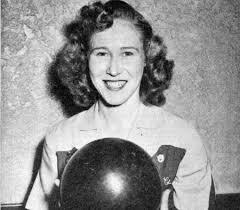 She won the 1946 USBC Women’s Championship singles title; was named the first “Women Bowler of the year” in 1948 and received the honor again in 1949. Val was a wonderful bowler, and was inducted into the WIBC Hall of Fame in 1979 for Superior Performance. Many of the records regarding her bowling were lost over the years, but we felt it was fitting to honor a bowler from Michigan and make sure she was also a part of our Hall of Fame.